The "Irwell Valley Motorway", Lancashire. It was supposed to meet the M62 at the "missing junction", 16, and head in towards Salford and Manchester. The junction numbers were slightly altered: junction 14A became 15, junction 15 became junction 16. So, where was it meant to go? It was supposed to leave the M62 at junction 16, which was supposed to be roughly halfway between the junction to either side, through Philips Park. 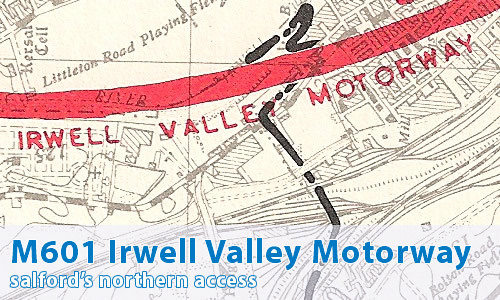 The Irwell Valley Motorway finished in the general area of Silk Street, Salford. You can see the proposed route here. You certainly have - it's where the M67 was also supposed to end! So, what was the M601 for? Well, it was designed to speed traffic in from the north and east to the city centre(s). It would have shared the load coming in from the M61 with the M602, relieving the A580 of much of its longer distance traffic, and would be the primary way in from Yorkshire. To be honest, I have no idea. I suspect it was something to do with the 1970s, and the general cancelling of all things expensive at that time for political reasons. If anyone has any further information about this, or anything else about this motorway, I'd be delighted to hear from them. I used to live up in Prestwich, and while it seems to date before my time, hadn't heard of this before. There is now a nature trail along an old railway line which I think was disbanded in the 70's. I can't quite see how they would have built a motorway alongside the River Irwell...there was a power station at one point, then some cemeteries. I certainly didn't know about this - the proposal really needs considering again, as the A56 becomes impossible in rush hour (and, in fact, during all daylight hours) and really needs a bypass. Having said that, as Phil has already said, there are serious difficulties - the river, power station and new housing developments on the Agecroft Road (A6044). There certainly isn't any way it can join up with the inner ring road - unless some city-busting M23esque tactics were implemented! Anyway, I was looking through an old 1972 AA Atlas last night, and looked at the "M68". The stretch that is now M60 J18-19 is marked M66 - and only this bit of the M66 is open (however, some of the present day M66 is shown as under construction). So unless this is a mapping error (unlikely), I suspect the decision to change the M68 to M66 was by 1972-3 at the latest. Attached is a scan of that piece of map - apologies for the low quality, that's due to my scanner. This same attachment also has something (else) interesting - there is a J16 marked on the M62! A junction that is attached to no roads! Presumably this is where the M601 would have gone - was this junction under construction in 1972 (despite not being shown as such on the map), ready for the M601 that wasn't? I can claim to be a regular user of this motorway. It ploughs straight through the main car park of Salford University where I parked my car for three years. It would also have knocked down the university pub. I lived two years in Kersal and two in Castle Irwell the old racecourse in the river loop and would have been right on its doorstep if built. I must say, how astonished I am to see the route this would have taken. Having bought a house just 6 years ago, which effectively would have overlooked this high upon Carr Clough, the noise from this would have carried up the valley and affected all the housing along here from Agecroft. So I wouldn't have bought here. It's still amazing to see things like this and it does answer the question I've been asking all these years ... why was there no junction 16. I used to joke wryly to my friends and family, that if you ever came off at junction 16, you'd be no more. As a kid in the early 70's living in the Lower Broughton area of Salford, I remember my parents telling me that we had to move as our house was going to be knocked down as a motorway was going to be built. I thought nothing more of it until I saw your map. Our house was at the bottom end of Lower Broughton Road where it meets Great Clowes Street right on the border of the River Irwell. This is the general area (Silk Street) where this motorway was planned to meet another of the roads I knew nothing about - The Manchester Inner motorway. Shame it wasn't built as like the others, the roads north from the M60 into Manchester are single file A roads and are completely jammed seven days a week. I'm glad this motorway wasn't built - much of the route would have destroyed the Manchester, Bolton and Bury canal as it passed through Agecroft and Pendleton. It would also have destroyed Clifton Viaduct, a 13-arch railway viaduct of some beauty. As things stand, theres no chance of it being built now anyway as the route of the canal is protected from any building.